I hope that you will please forward this to the appropriate individual(s). Today, Sunday 2-8-09, I stopped at the Race Tech booth at the International Motorcycle Show here in Chicago and spoke in great length with Matthew Wiley. I am currently under construction on a 1982 Honda CB750F I will be running this year in the ARMA Vintage Superbike Heavyweight class. I am a small fish in a huge pond so this is an large undertaking for me and I want to express my appreciation to Matthew and compliment his willingness to answer my questions and offer technical advice. Matthew didn't try to rush through my questions just to "make a sale" and get rid of me. He was willing to spend as much time with me as needed to ensure I understood exactly what Race Tech products offer over its competitors (Works and Ohlins) as well as provided suspension geometry information that will prove invaluable as I am currently in the process of designing and fabricating a custom swingarm. I was already sold on Race Tech front fork products, and had been in contact with Works Shocks about custom rear shocks, I was not very pleased with Works' willingness to offer advice pertaining to my swingarm design. Recently I was looking through the Race tech website and noticed that you are now making rear shocks. So, the opportunity to speak with Matthew in detail about the rear shocks Race Tech is now offering, as well as see a sample of the quality of product you sell has proved to me Race Tech's commitment to racers. As far as I am concerned 'the other suspension companies' can't compete and don't even exist anymore, I am sold on Race Tech for my all of my suspension needs, you will be seeing an order for rear shocks from me very soon. I have several friends currently racing with ARMA and I also want to commend Race Tech on its support of the vintage crowd, I know vintage is a small, niche market and not a high profit margin venture, that kind of support is rare these days and validates that Race Tech is type of company I want to do business with. It is rough for us little guys without any kind of sponsorship and limited financial resources that are out here purely doing this for the love of racing old bikes, however, when I have a experience like I did today with Matthew it makes spending an entire paycheck on a component gratifying because you know it is not wasted money and someone cares that you thought enough to spend it with them and want to give you the best product and support possible. Please make sure that Matthew is recognized for his passion and commitment to reflecting Race Tech in the best possible light! 'Thank you Race Tech! With your full fork setup and help from Matt getting it dialed and servicing my shocks on my AHRMA Race bike it now tracks perfectly and soaks up the bumps. Your AHRMA Rider Support is great!" With the implementation of transponders by AHRMA, the results of making changes in bike set-up are now available to us accurately and almost instantaneously. Frame bracing and adding an extended swingarm and a steering damper had helped make the Z1 more stable, but the front-end had always pushed and chattered. Race Tech did their magic on the stock forks of my 1973 Kawasaki Z1 and truly made it a different motorcycle. 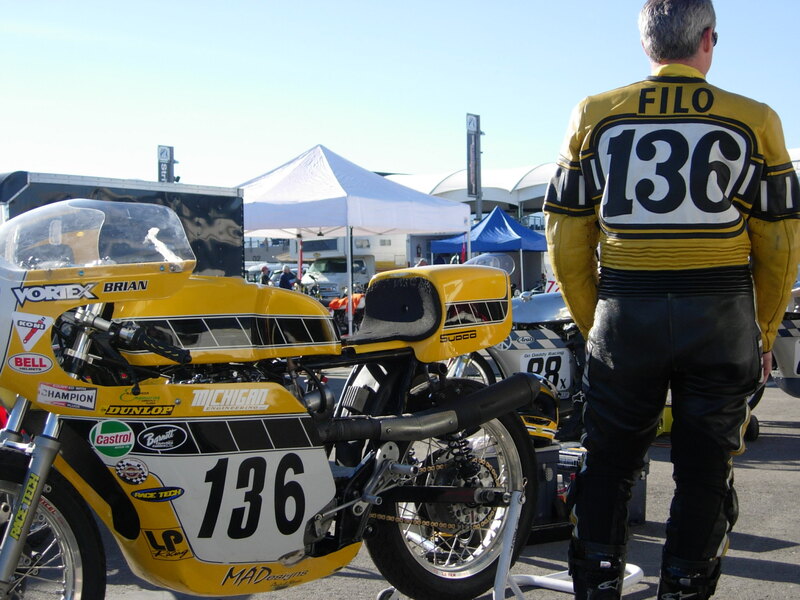 At Miller Motorsports Park 2008, the bike was much better right off the trailer. With Matt's tireless efforts in wanting to tune the suspension to the track, my lap times dropped 3 seconds from Saturday's practice to Sunday. The front end no longer chattered and the bike was much easier to ride. It tracks right where it's pointed without having to make corrections mid-turn. 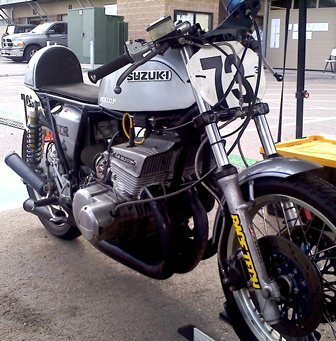 For 2009, I will be racing a second motorcycle that is under construction. Without question, Race Tech will get the forks and shocks to upgrade. I spoke to you at the show in Cleveland last January about my wife's 1981 Honda CM400A. We got the springs and gold valves installed and can't believe it's the same bike. It originally had air assist forks and we removed the plumbing and put plugs in the holes left in the caps. 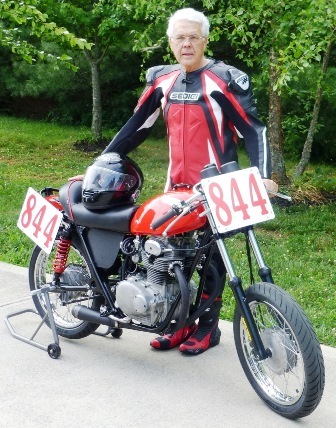 "I chose Race Tech My AHRMA 350 Sportsman and it really works! Matt guided me on choices and performed a complete fork conversion. We hard anodized it along with Gold Valves and Custom Fork Springs. The black and red G3-S shocks work even better than they look! I was not sure of having Brake Arc was really worthwhile but WOW was it! My Race Tech setup put me on the podium my very first ever AHRMA race weekend! Thank you Race Tech & Matt for a great setup. My Race Tech Suspension is awesome on my AHRMA GT550! The engine makes 70hp and the stock suspension was totally overwhelmed. I had Matt set me up with G3-S shocks and full fork setup, my bike became ridable and lap times dropped by 5 seconds!